Offering premium LOCAL AND LONG DISTANCE MOVING, PACKING AND STORAGE at a reasonable rate. Randal Moving and Storage offers local and long-distance moving service with storage options under a 24-hours security system. We are your local professional residential relocation and storage specialists. Randall Moving and Storage is a military approved local and long-distance carrier. When you contact Randall Moving and Storage, you are calling an American Moving & Storage Association Certified PRO-MOVER, independently owned and operated by our family since 1979. Accredited by the State of Virginia and authorized by the Interstate Commerce Commission to move and operate anywhere within the Continental United States. Licensed and insured, with both intrastate and interstate authority. 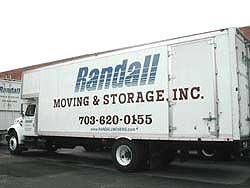 Randall Moving & Storage has been moving Northern Virginia families and businesses since 1979. With the benefit of over three decades of experience, we've tackled some of the most challenging moves imaginable. What really sets us apart from other movers is the professionalism and experience of the full-time crewmen who have been with our company for a decade or more. Our customers will tell you they are truly outstanding. "to consistently offer and provide the most efficient and reliable moving and storage services available, while adhering strictly to a policy of truth, honesty, integrity and fairness in all business transactions." Where we provide moving services: While based out of Manassas, Virginia in Prince William County, we also serve all of Fairfax County, including Herndon, Reston, Centreville, Arlington, Leesburg, McLean, Vienna, Oakton, and Alexandria. They knew exactly what to do...what an excellent move!! I was skeptical and worried about selecting a company to move us. What can I say, it was needless worry. You made it all work from the time we scheduled until we unpacked. All went better than I could imagine. The new buyers were anxious to get in and we were on a tight timeline. Your guys got us done ahead of schedule! The guys knocked out the job with amazing professionalism. I know who I will call and recommend for any moving needs in the future. My sudden notice to move cause a great deal of work and headaches. I knew something would happen with the move, but I was wrong...it went perfectly. THANK YOU! -- Sam W., Washington D.C. Please check out more REVIEWS and even better, add a new one!